Economic Affairs Minister Chris Cardona said on Tuesday that attempts to somehow link him to the murder of Daphne Caruana Galizia because he may have been present in the same event as a person of poor record were 'ridiculous' and amounted to 'mental arrogance'. 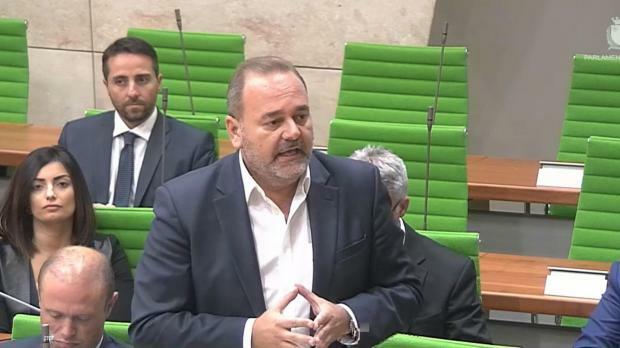 Dr Cardona was speaking in Parliament after Nationalist MP Jason Azzopardi referred to information revealed yesterday by the Daphne Project and asked the minister whether he had gone to the police in the last 24 hours to explain his position. The minister said he was challenging any MP, but particularly lawyers, to vouch that they were never present for any event, whether it was a wedding, reception, or something else, where people with a bad record were present, or that they had never received a phone call from such a person. Early in his reply, Dr Cardona hit out at Dr Azzopardi and challenged him to repeat his remarks outside the House. Dr Azzopardi said he was divesting himself of parliamentary immunity. Dr Cardona said he said that this was all legalese. Dr Cardona said he was shouldering his constitutional responsibilities with maturity and it was a shame that the opposition, or rather some of its MPs, wanted to somehow link him to the Caruana Galizia murder. Everybody knew that people who were lawyers or politicians, or indeed, lawyers and politicians, were invited to events where many other people were present, some of whom may not be of good character. But as also seen in the Egrant affair it was not justice and the truth which the Opposition was after. Rather they were trying to smear him and the government. Despite preaching that they believe in justice, so far no one from the Opposition had assumed responsibility for the Egrant lies against the prime minister and his family. As for political responsibility, perhaps the members of the Opposition could remember how in the past, a sitting prime minister had even met a convicted criminal in the dark of night under a bridge. That was far from a casual meeting at some event, but apparently, there were two yardsticks. Referring to interruptions by Nationalist MP Karol Aquilina, Dr Cardona asked the Nationalist MP where he could vouch to never having been in the same place mentioned in the media. Dr Aquilina said he had been there on two occasions, but his attempts to explain further were drowned out by laughter on the government benches and applause for Dr Cardona. Continuing, Dr Cardona said this was only a smear campaign against him and amounted to the lowest ever level of 'mental arrogance'. The sitting was then interrupted amid angry exchanges between the Prime Minister and former Opposition leader Simon Busuttil about the Egrant affair. Later, Dr Busuttil called on the Prime Minister to substantiate or withdraw his comments, which Dr Busuttil said had included the accusation that he had falsified signatures.